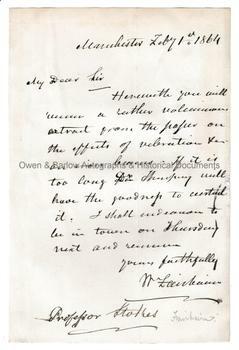 SIR WILLIAM FAIRBAIRN Autograph Letter Signed. British (Scottish) structural and civil engineer. ALS. 1p. Manchester. February 1st, 1864. To Professor [George Gabriel] Stokes. "Herewith you will receive a rather voluminous extract from the paper on the effects of vibration stress (?) on iron beams. If it is too long Dr Humphrey (?) will have the goodness to curtail it. I shall endeavour to be in town on Thursday next and remain yours faithfully, W. Fairbairn." 8vo. 18.5 x 12 cms (7.5 x 5 inches). Possibly lacking the blank leaf of a bifolium but there is no evidence that such has been excised. Slight mounting traces to verso. Very good. Sir William Fairbairn had been a pioneer of iron girder construction and it was he who had suggested the idea of box girder construction for a bridge over the Menai Strait when he was retained as a consultant by Robert Stephenson. He later did pioneering work into the effects of stress on iron girders (now known as metal fatigue). It is in this connection that he is here writing to Professor Stokes (probably in the latter's capacity as secretary of the Royal Society). Providence: From the 19th century album compiled by the family of Dr James Copland F.R.S. (1791-1870), the notes Scottish physician and writer on medicine.